Making a pudding is guaranteed to put you in a festive mood. The aroma of fruits and spices that fills your home as you mix the ingredients seem to conjure up the spirit of Christmas. 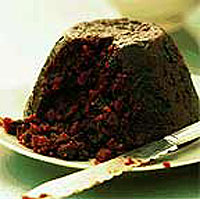 The secret of a successful pudding, with its dark colour and rich flavour, is the quality of the ingredients and the length of time it is cooked. So begin the day before and don't be tempted to cut corners. Here we have added cherries and cranberries for a twist to a traditional recipe. Place the fruit, spices and liquids in a large bowl. Mix well, cover with a clean tea towel and leave to stand for at least 6 hours, preferably overnight. Once the fruit has plumped up, stir in the remaining ingredients and mix thoroughly. Transfer to a lightly greased pudding basin, packing it down to ensure it all fits. Cut 2 squares of parchment paper about 20cm wider than the basin radius. Cut a piece of foil about the same size. With the foil at the bottom, fold the three layers in half, then take one side and fold it back about 2cm from the first fold to make a pleat. This will allow the pudding to expand during cooking. Put the foil and parchment paper on top of the pudding with the foil uppermost. Take a long length of string, fold it in half and wrap it around the bowl to secure the paper and foil. Thread the ends of string through the loop, tighten and knot to secure. Use the excess string to make a handle across the bowl for lifting. Trim the excess parchment and foil from the pudding top. Place a trivet or heatproof plate in the bottom of a large pan. Add the pudding, then carefully pour boiling water around the edge of the basin until it is about halfway up the side of the basin. Place on a tight-fitting lid and bring to the boil, reduce the heat immediately and steam the pudding for 6 hours. Regularly check the water and top up with boiling water if required. After 6 hours, turn off the heat and leave the pudding to cool. Use the string to lift it from the pan. Wipe the outside of the basin, undo the string and remove the foil and paper. Replace with new foil, parchment paper and string, and store in a cool, dark place until required for up to 2 months. To reheat, steam for 2 hours or remove the foil and place in a microwave (850w) for about 5 minutes. To serve, heat a spoon of brandy or rum in a small pan or in a heatproof dish in the microwave. Light with a match and carefully pour over the pudding. Serve immediately with a helping of brandy custard or fresh double cream. White or brown bread can be used to make the breadcrumbs. They can be stored in the freezer and used from frozen. As an alternative to the fruits in this recipe, use Waitrose Luxury Mixed Dried Fruit. If you like a Christmas pudding with nuts, take out some of the dried fruits and substitute with the same weight of nuts. Flaked or chopped almonds are traditional, but you could use pecan and pine nuts. If you prefer a lighter-coloured pudding, use light brown soft sugar and reduce the cooking time to 5 hours. You can replace the stout and brandy or rum with a fruit juice such as orange or apple. Instead of one large pudding, make several small ones. Make the mixture and divide it into individual pudding basins. Cook them together in the same way for about 2 hours. Use the smallest size basin you can find, as a large serving can be too much after a filling meal.